Home offices can be convenient and useful, especially if you need a separate work area for your job, but because they’re in your home away from the eyes of the public, it’s easy to let them fall into disarray. I don’t know about you, but this often leads to me having to spend a whole day digging myself out from under piles of bills, sticky notes, half-used supplies, and every other tidbit I decided to keep for later. 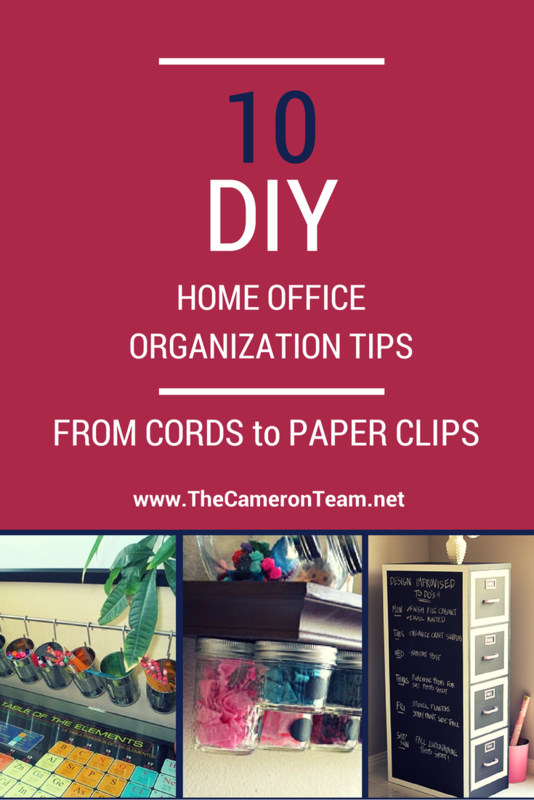 So, today, I thought I’d share some great DIY home office projects to help you stay organized and on top of the piles. 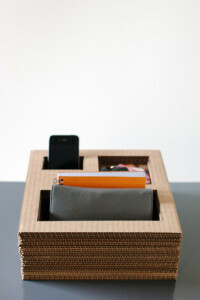 This project is very useful if you have limited space, because it makes 1 tool act as 2. 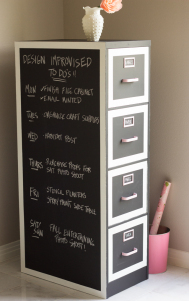 It takes the often underused surface space of the filing cabinet and changes it into a chalkboard for daily notes. It’s also a great way to make an old cabinet look new. Not sure who came up with this idea, but it’s a good one, especially if you’re always kicking your electrical strip or have it taking up space on your desk. Have a lot of cables? Can’t remember which goes where? 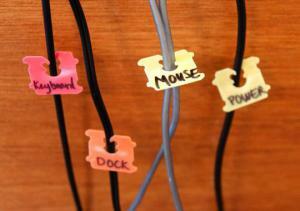 Make use of something you probably keep throwing away – bread clips! I wish I had found this back when I was looking for drawer organizers, because I had the hardest time finding one that fit my drawer perfectly and had the compartments I needed. I considered sticking some small containers together, but I didn’t think about layering and cutting to make my own. The best part is you probably have cardboard gathering in your house already and all you need is a utility blade, straight edge, pencil, and glue. 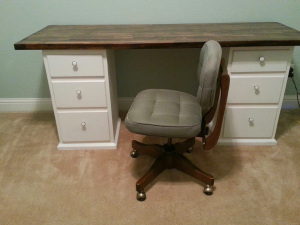 You don’t need to spend a bunch of money on a new desk for your office. This table is made from 2 nightstand bought at a thrift store and a butcher block. However, I’ve also seen Ikea cabinets, stock bathroom cabinets, filing cabinets, recycled doors, and MDF boards used. Basically, you just need two small tables or cabinets of the same height and a sturdy long, flat piece for the top and you have a table! Best part is you can customize it according to your needs. Instead of adding bills and paperwork for your next task to a pile on your table, hang a wire basket on the wall in front of or on the side of your desk and use colorful folders for a decorative touch. As tasks are completed, file or throw out papers as needed. Then, once or twice a week, scan the folders to make sure nothing has been overlooked. This will help keep your piles under control. 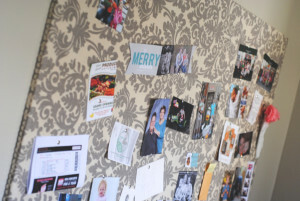 Cork boards are great for tacking up reminders and pictures, but they can be kind of ugly. Enter the Fabric Pin Board! These are, basically, cork boards covered in fabric. They’re super easy to make. You can make one big one or cluster a few small ones together with each one for a specific category of use. 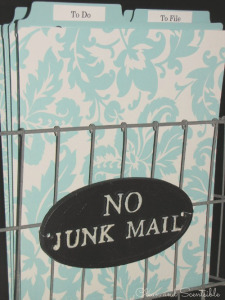 You can frame them or leave them plain, and you can choose the perfect print for your office. Need your writing utensils at the ready? Here’s a creative way to hang them over your desk. 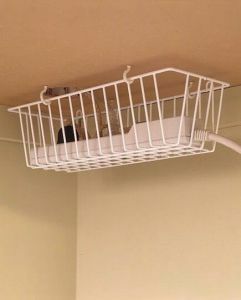 Secure a towel bar to the wall and hang soup cans from S hooks. Want something a little fancier? Cover them in fabric (match them to your pin board!) or substitute with wall pockets. 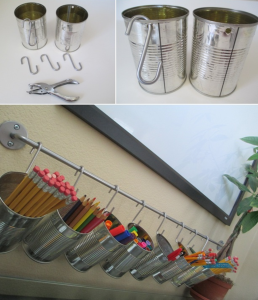 You can also hang other tools, like scissors and hole punches. There are multiple shelving styles for the office that you can choose from. You can makeover a garage sale find or customize a box kit, or even install the metal wall kits you can find at Lowes. If you’re lacking floor space and need something sturdy for up high or have an odd alcove, floating shelves can be a great choice. 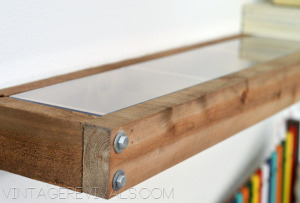 Already have shelves hanging in your office? The area under shelves can be highly un-utilized. 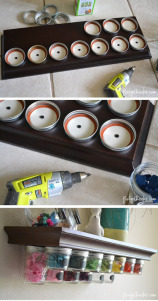 Take advantage of it by hanging mason jars. It’s super easy to do. Just choose the best size jar and screw the lid to the underside of the shelf. Mason jars can hold receipts, pencils, paper clips, keys, stamps…even your candy stash! 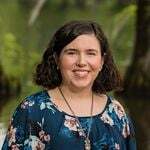 If you found this list as helpful and inspiring as I did, please pin it!